I get so excited when new vegan restaurants open up in Montreal. I love eating at vegan joints – knowing that the whole menu is up for grabs is such an exciting feeling! 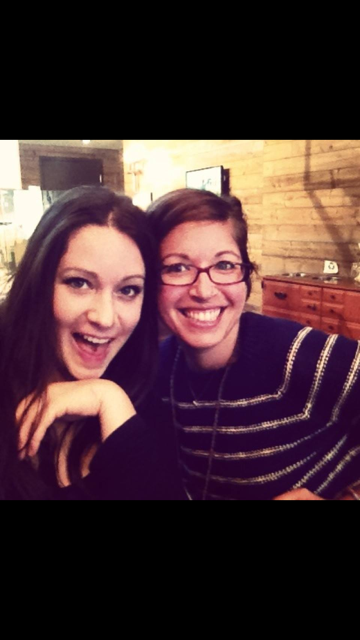 When i heard that a restaurant named Copper Branch was opening its doors in the Downtown core, I contact my favorite vegan pal Melissa and we made a date to check it out. We were NOT disappointed. Upon first glance at CB’s menu, I was happy to find staple comfort foods like poutine, burgers, coleslaw and brownies. They also have rice bowls, smoothies and a small breakfast menu, which i must come back to try. Melissa and I decided to each take a different burger, and split it. We also shared poutine, baked fries and a brownie. The first burger i bit into, the Copper Burger, was INCREDIBLE. Copper Branch’s take on the beet burger was a huge hit. The burger itself was robust, and not too messy. The bun was delicious, and the condiments complemented the whole sandwich incredibly. It was definitely my favorite of all the food we had ordered. 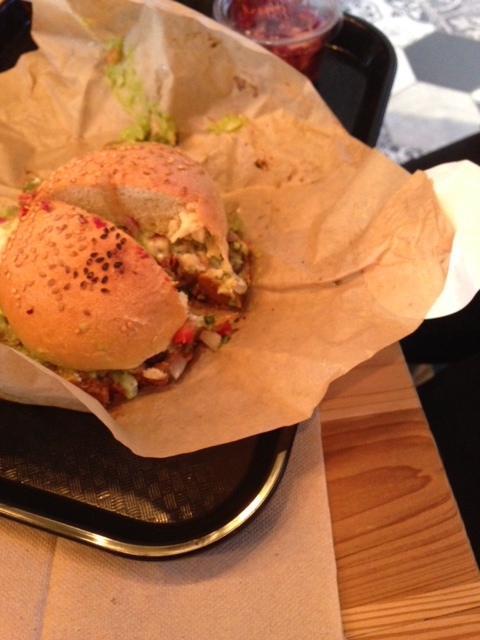 The second burger, the black bean burger, was also delicious. However, it was EXTREMELY messy. A yummy black bean patty topped with a generous helping of guacamole gave the burger a delicious taste, but the amount of napkins i needed for cleanup was embarrassing. This was definitely not a date night burger. Luckily for me, i have no shame, so i savored every bite. Another of my favorites was the poutine. 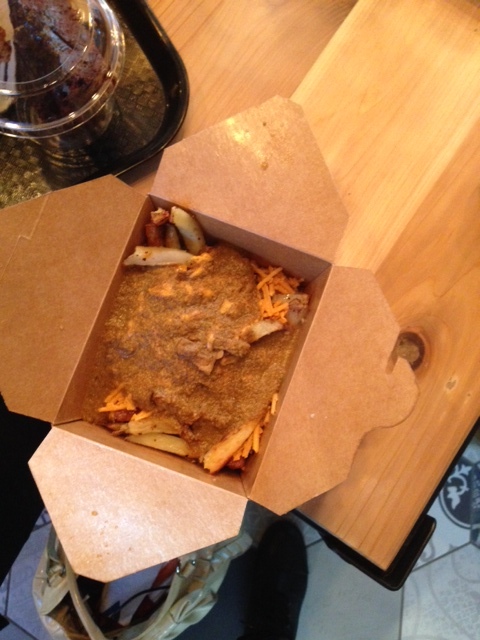 The gravy is miso-based, the cheese is delicious daiya and the fries are oven baked. I loved it. The miso gave the whole dish a salty, “junk food” taste without the unhealthy side effects of traditional poutine. Love at first bite. I also ordered a side of oven-baked fries “sans” gravy and daiya, and loved the seasoning. The cherry on top of this lunch of Champions was the delicious chocolate-zucchini brownie. Decadent, creamy frosting and a sprinkling of hemp seeds cover a moist and delicious cake that kind of reminded me of McCain Deep and Delicious freezer cakes of my youth. All in all, the general consensus between the table was a million thumbs up. I will definitely be coming back for the Copper burger and poutine, and would like to check out their rice bowls in the future. I urge you all to check out Copper Branch, and support this local vegan establishment! On another note, the beautiful Melissa pictured above, who joined me in this epic lunch, is an incredible wedding and event videographer. Check out her work here!